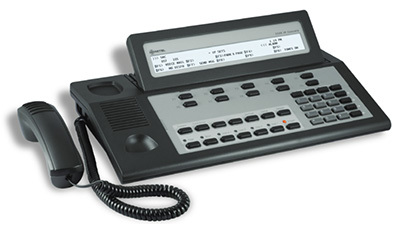 Mitel's MiVoice 5540 IP Console is an economical console for use with the MiVoice Business solution or Mitel's SX-200 IP Communications Platform. This economical console is an ideal attendant solution for small and medium businesses as well as hospitality providers in the hotel /motel industries. Affordability, simplicity, and a broad range of standard and specialty functions make this console a smart choice. The MiVoice 5540 features a highly-visible backlit tilt display with 14 fixed function keys dedicated to basic and enhanced call-handling activities. An additional 10 softkeys control access to the attendant features through call state sensitive keys. The console can also be connected remotely via the MiVoice Border Gateway and Mitel Teleworker Solution, providing attendants the ability to work anywhere and anytime. In Mitel SX-200 environments, two 48-button Mitel IP Programmable Key Module 48 units can be attached to provide up to 96 additional Direct Station Select (DSS) / Busy Lamp Field (BLF) keys. Two integrated headset / handset jacks also give users the ability to leave their desks while taking calls. Combine the Mitel 5540 IP Console with Mitel's 5505 Cordless IP Guest Phones and MiVoice Business for a cost-efficient hotel / motel phone system. Change / clear users' status to "Do Not Disturb"